Quick. Product is just what I needed. I had no issues. Great site and will be back when I need HD-SDI. Optical Multiplexer is popularly with telecommunication operator and suitable in business for communication operator, government and kinds of entities. It is one of the most transmission equipment in point-point fiber optic network. Typical optical multiplexers are Video & Data & Audio Multiplexers, PDH Multiplexer. 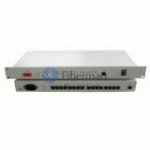 Fiber-Mart optical multiplexers are highly manageable, accompanied by a network management system for configuration, service, performance, security, and fault management that enable cost-effective and efficient transport.